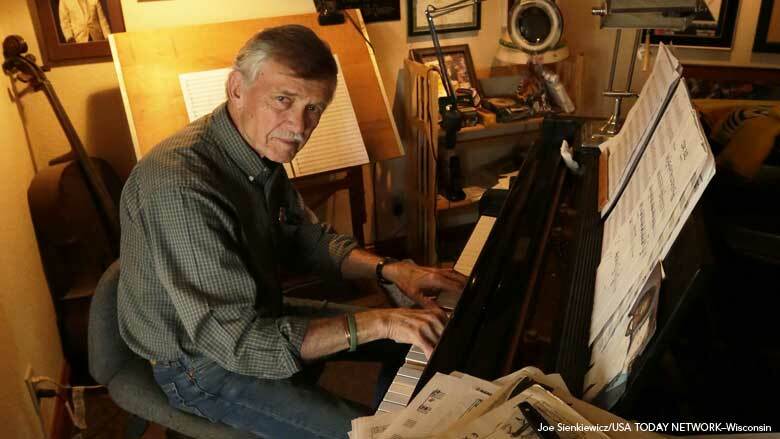 In John Harmon’s home studio, filling the shelves and file cabinets beside a well-used baby grand piano, are hundreds of beautifully handwritten manuscripts that chronicle over sixty years of musical composition. Mementos lining the walls of the Winneconne home where he lives with his wife, Linda "Traf" Harmon, offer a glimpse into the storied composer’s interest in visual art, the environment, and Native American cultures. Harmon’s first foray into music came through childhood piano lessons with his mother. The two would sit together and play “four hands,” figuring out popular songs like “Sweet Georgia Brown” by ear. While his mother taught Harmon the popular music of the day, his father introduced him to the world of jazz. Harmon soon began to mimic the artists he heard on his father’s favorite records—Duke Ellington, Teddy Wilson, and Art Tatum—and found new sounds at the keyboard through exploration and experimentation. Upon the recommendation of a family friend, Harmon applied to study music at Lawrence University. There, Harmon developed a fondness for some of history’s great composers—Stravinsky, Debussy, and Brahms, among others. His coursework gained him a strong foundation in technique and sparked an everlasting curiosity. But it was his passion for jazz that led Harmon to the Lenox School of Jazz, a short-running summer program held in Lenox, Massachusetts, that groomed luminaries such as Ornette Coleman. Harmon credits his time at the Lenox School as one of his most formative experiences, during which, besides developing his piano skills, he broadened his purview of harmony and improvisation. As a member of the program’s inaugural class of 1957, Harmon trained with a distinguished faculty that included Dizzy Gillespie, Max Roach, Bill Russo, John Lewis, and, most significantly for Harmon, pianist Oscar Peterson, whom Duke Ellington once referred to as the “Maharaja of the keyboard.” Harmon says that Peterson “opened up a whole new life” for him by showing Harmon new ways of considering musical texture and expanding his harmonic palette. The Lenox School gave Harmon a real sense of what it meant to be a working musician, a lesson that would prove invaluable to his career. After a stint in the army, Harmon cut his teeth in the 1960s New York City jazz scene. For ten years, Harmon played clubs around The Village and watched some of the biggest names in jazz perform. His skill at the piano took him beyond the clubs of Manhattan to cities across America and, eventually, Europe, where he led a piano, bass, and drums trio on a USO tour. Taking note of his growing reputation in the jazz world, Harmon’s alma mater asked him to return to Appleton to head Lawrence University’s new Jazz Studies program in 1970. Harmon transitioned into his new pedagogical role well, tapping into his wealth of experience to conduct, teach, and arrange/compose for the Lawrence University jazz ensemble. In his second year there, Harmon led the school’s ensemble to a victory at the Intercollegiate Jazz Festival, elevating the program’s national reputation. Inspired by the talent of his students and colleagues at Lawrence, Harmon decided to form his own group, one that had its roots in jazz but pushed the envelope of the genre. In 1974 he formed Matrix, a jazz-fusion group that coupled the power of a big band with the agility of a small ensemble. Harmon, who was the main composer and pianist, refers to his eight years with Matrix as “the most amazing chapter” of his life. Composing for a group of players willing and able to tackle new and difficult projects, Harmon explored dynamic themes, experimented with genre splicing, and generated a unique sonic signature for the band. Matrix recorded several well-received albums, performed at some of the country’s biggest jazz festivals, and won awards for their groundbreaking sound. Over the years, Harmon has been recognized repeatedly for his contributions to Wisconsin’s music community. He received an honorary Doctorate in Fine Arts from Lawrence University (2004), a Fox Valley Arts Council’s Renaissance Award (2000) and a Distinguished Service Award from the Wisconsin State Music Association (1999). In 2005, Harmon was named a Fellow of the Wisconsin Academy of Science, Arts, and Letters. Even with all these awards and a successful career as a composer and performing musician, Harmon says that teaching has always been one of the most satisfying parts of his musical life. Harmon cites his years in the Oshkosh and Appleton Public School Districts as one of his most challenging compositional experiences. As composer in residence, Harmon was charged with writing for myriad ensembles and skill levels. He remembers the students as “fearless.” The Red Lodge Summer Music Festival, a music camp in Montana for high school-age students, continues to be perhaps his favorite teaching experience. The familiar faces, talented faculty, and eager students draw him back every year. A widely commissioned composer, Harmon has written music for the Milwaukee Symphony Orchestra, “The Orchestra” of Los Angeles, the Fox Valley Symphony, and the Santa Fe Chamber Orchestra. Harmon says that he has always used his craft to provoke awareness, a kind of “musical activism,” in one way or another. Throughout his career, Harmon has had a predilection for political and social matters regarding First American cultures as evidenced by a sample of his compositions: Seven Arrows (1991), a six-part choir for low brass; Prayer for the Bison (2000) a clarinet and marimba duet; and Hopi Prayer (2005), a composition for solo piano. A devoted learner, Harmon reads about Native American history and politics and often visits Native American communities. Harmon recalls an especially formative trip to the New Mexico Pueblos, native communities that preserve traditional Southwestern Native American ways of life. Traveling with his friend and well-known jazz trumpeter Bobby Shew (who is part Cherokee), Harmon immersed himself in the native culture of the Pueblos, gaining a window into their traditions and lifestyles. As Harmon continued to learn more about the current state of Native American cultures, he felt compelled to give voice to their plight. With his newest compositions, which he calls “awareness symphonies,” Harmon deploys the most thunderous musical voice at his disposal, the symphonic orchestra, to call for the preservation of not only Native American cultures but also their histories. His awareness symphonies address Native American matters ranging from the historical to the contemporary: from conflicts with the Europeans who settled in America to protests over the Dakota Access Pipeline at the Standing Rock Sioux Reservation. Completed in 2014, Harmon’s first awareness symphony tells the story of Crazy Horse, a leader of the Lakota, a Sioux people of the plains of North and South Dakota. Crazy Horse is perhaps best known for his role in the defeat of the U.S. Army’s 7th Cavalry Regiment led by General Custer in the 1876 Battle of Little Big Horn. Though this battle was a victory for the Lakota, future conflicts would deplete their population, putting them in a dire situation as they approached winter. Witnessing their people suffering due to diminishing resources, Crazy Horse and other Lakota leaders decided to surrender in August of 1877. Crazy Horse died in the custody of the U.S. Army at Fort Robinson, Nebraska. By recasting Crazy Horse’s story in orchestral form for his eponymous symphony, Harmon presses listeners to consider the consequences of America’s relentless western expansion and seizure of Native American lands. Through lush harmonies, songful melodies, and a Stravinsky-like orchestration, Harmon’s musical rendering of the story tactfully invites listeners into its sonic milieu while urging them to consider deeper issues of justice and human rights. Harmon has always said, “Titles are important to me.” As such, the titles of the movements of Crazy Horse point to significant portions of the great hero’s life-story without spelling them out pedantically. The symphony’s first movement, “Youth: The Journey Begins,” tells of the young Crazy Horse’s coming of age in the traditions of his people. Several melodic themes in this movement, such as the bassoon and xylophone’s opening theme, become associated with the historical Crazy Horse. In reviving this theme later through the piano, Harmon puts a personal touch on it, making a direct connection to the story of Crazy Horse. This memorable musical theme carries into the following movements, providing the listener with a main character of sorts for the unfolding musical narrative. The second movement, “The Deepening,” turns more introspective, offering insight into Crazy Horse’s personal growth. The main theme now sounds in the oboe and develops into a full-fledged melody—a metaphor for the Lakota leader's maturing intellect, humility, and compassion. In “Little Bighorn: June 25, 1876,” the third movement, Harmon makes a decided departure from the symphony’s main theme. Beginning with a soft rumble, this movement quickly builds, borrowing orchestral textures and melodic figures from earlier movements to gain momentum. One passage seems to represent the outnumbered 7th Cavalry approaching its well-prepared opponent. Suddenly, the tonality drifts, and the orchestra enters into a cacophony of competing themes and rhythms, a battle fought in the music’s very syntax. We sense the cavalry realizing its mistake as the brass and percussion sections attempt but ultimately fail to take charge of the sound-space. A decisive climax—perhaps General Custer’s last stand—concludes the battle, and the movement promptly slows, as if surveying the bloodshed. Emerging from the battle, the symphony’s main theme returns with the clarinet bringing the boisterous movement to a quiet close. Though Crazy Horse may have been victorious, there is certainly no cause for celebration. The fourth and final movement derives its title from Crazy Horse’s most well-known statement: “My Lands Are Where My Dead Lie Buried,” a response to an adversary’s barbed remark—“Where are your lands now?”—after Crazy Horse’s surrender. This last movement divides into two clear sections—fast and slow—separated by a contemplative flute solo that reframes the main theme. Recalling many of the songful motifs from the previous movements, the finale forms a sense of cohesion across the symphony, bookending the work. It seems only appropriate that a wonderful orchestra from Harmon’s hometown, the Oshkosh Symphony Orchestra, recorded his first awareness symphony on December 3, 2016. Under the direction of Daniel Black and accompanied by Harmon’s son Noah, an accomplished pianist in his own right, the ensemble vividly rendered Harmon’s vision. The subsequent recording embraces listeners with a warm sonic hue and dawning awareness of the complex story of the man known as Crazy Horse (listen to a sample here). Matt Ambrosio is a PhD candidate in the UW–Madison Mead Witter School of Music. His research focuses on topics of philosophy and music at the turn of the twentieth century. Originally from New York, Ambrosio spent four years teaching physics in Washington DC public schools and continues to work in education today.